We are always offering special promotions and/or discounts to give back to our valued customers. Often times through the year we are collecting items for our local food pantry, prom dresses for students, and we also host a variety of events and fundraisers - we have been a part of this community for over 15 years, and love giving back! Check back and visit this page from time to time to see any of our current specials. 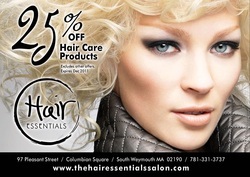 Print this coupon to save 25% off your first retail purchase at Hair Essentials. 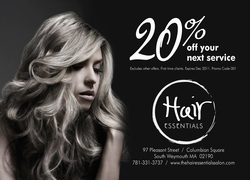 Print this coupon to save 20% off your first service with Hair Essentials. Always remember to check-in via Facebook for the latest promotions / free giveaways on a weekly basis! Each week a Facebook "Fan of the Week" will receive the latest services offered at Hair Essentials.